Albert Fell was born 15 Dec 1843 on the plantation of Joseph Mikell on James Island, Charleston District, South Carolina. In 1866, Albert married Hannah, who had been enslaved by Tom Legare on James Island. Albert and Hannah knew each other from their childhood days and neither had been previously married. In 1904, Albert listed his living children as Robert R. Fell, Daniel Fell, Elizabeth Fell, Martha Fell, Isiah Fell, Henry Fell and Julia Fell. He stated that Julia, the youngest of the children, had turned sixteen in March of 1904. In May of 1907, Albert was living at 226 St. Philips Street in Charleston. At the time of his death, his address was 162 Smith Street. He died 9 Jul 1912 in Charleston, SC. Dr. G. Fraser Wilson attended Albert in his final illness. His daughters were Julia Fell and Elizabeth Fell Potts. Albert Fell’s wife Hannah died 9 Aug 1910 in Charleston, SC. During the war, Albert and other members of the enslaved community on Joseph Mikell’s James Island Plantation were taken to St. Andrews Parish, about twelve miles from downtown Charleston. Albert and others escaped from there and joined the United States Colored Troops. They were taken by boat to Hilton Head, SC, where they were mustered into the service. Albert served as a private, then a corporal in Company F, 103rd United States Colored Troops. He enlisted 28 Feb 1865 at Hilton Head, SC and was honorably discharged at Fort Pulaski, GA on 17 Apr 1866. He was described as being 5 feet, nine inches tall, with black eyes and hair. Albert stated in 1904 that after his discharge from the service, he lived in Charleston for a few months, went to James Island and lived there for six years, then returned to Charleston, where he was living at 167 Smith Street. After Albert Fell’s death, his daughter Elizabeth Fell Potts, who was 31 years old and living at 162 Smith Street in Charleston, applied for reimbursement of his burial cost and pension arrears for the last month of his life. Receipt for burial expenses for Albert Fell, Veteran of Company F, 103rd USCT.Pension File of Albert Fell, certificate #1,108,882. 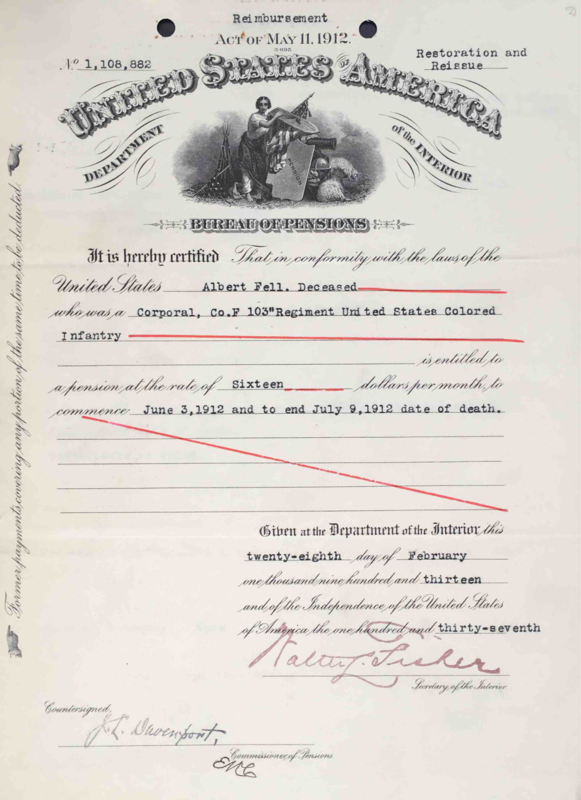 Albert Fell was issued pension certificate number 1,108,882 and was pensioned at the rate of twelve dollars per month under the Act of February 6, 1907. His pension was increased to sixteen dollars per month under the Act of May 11, 1912. Pension Award Certificate, Pension File of Albert Fell, certificate #1,108,882. 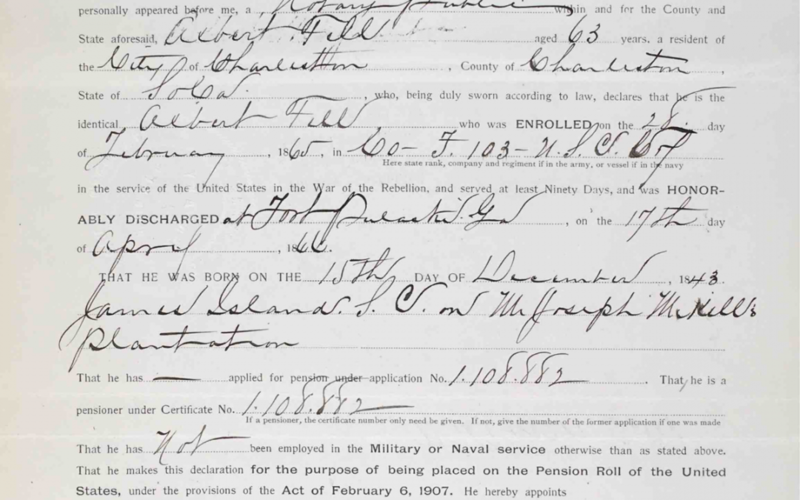 Albert’s original pension file application, made on 23 Mar 1897, was filed by attorney George McClay, who was later convicted of forgery and filing false claims, and sentenced to six years in prison. Because McClay prepared Albert Fell’s pension claim, the claim was sent to a Special Examiner for verification. The Law Division judged Fell’s claim to pension was valid, and his pension was granted. 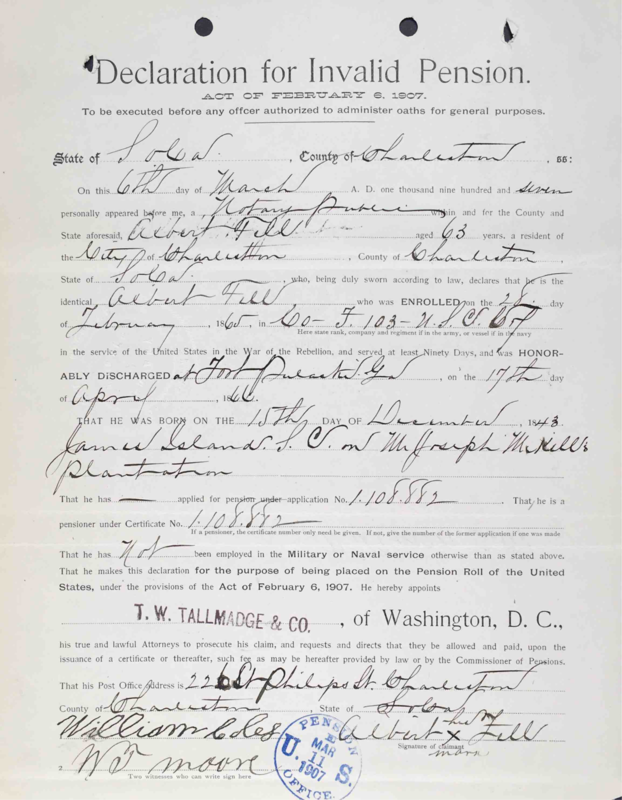 The disabilities claimed in the application filed by George McClay were rheumatism of limbs, catarrh of head, throat and lungs as a result of malarial fever, and rupture of his right side. After review, Albert Fell’s disabilities were deemed to be valid and no further investigation was made. On 6 Dec 1906, Fell applied for an increase in pension. At that time his attorneys were T.W. Tallmadge and Co., Washington, D.C. Witnesses to the apllication were Cooper Wilson and Jas. Drayton of Charleston. Witnesses to Fell’s original claim in 1897 were Pompey Grant, address 26 Remby Street, Charleston and James Weeks, address 4 1/2 Johnson Ct., Charleston. Dr. A.C. McLennon examined Albert Fell on May 3, 1905 and found him to be suffering from catarrh (cold or sinus infection), weakened eyesight, general debility and prostatitis, warranting a rate of six dollars per month invalid pension. 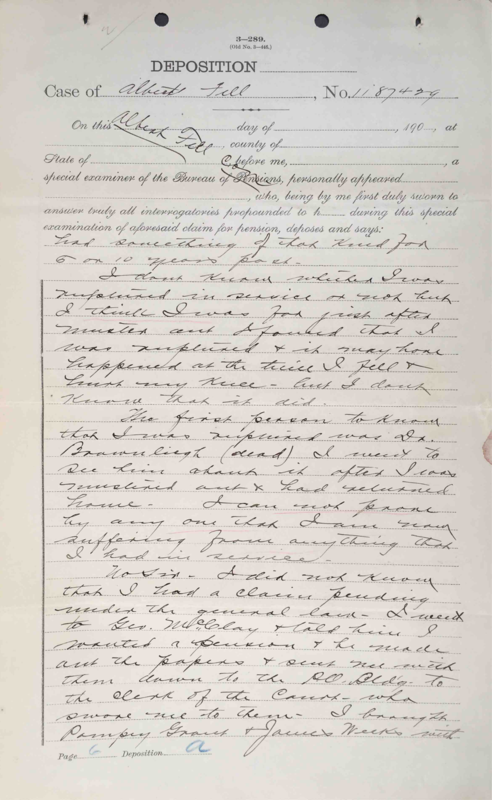 On 4 May 1904, Dr. A.C. McLennon examined Albert Fell again and found him to be entitled to a rate of six dollars per month pension for debility due to his age of 62. On 27 Aug 1901, George C. Stewart, Acting Chief of the Law Division, reported to the Board of Review that Fell’s case was examined because the original attorney was George McClay, but his claims were found to be valid and no further action was contemplated. Summary of statement of Albert Fell, 17 Jul 1901: Albert Fell stated that he did not know his age but thought he was about 60 years old. His occupation was laborer, and his address was 153 Cannon Street. Albert stated that he was born and raised on James Island, where he was enslaved by Joseph Mikell. At the time of his enlistment, he was a foreman, “called drivers in those days – we had to keep the hands going.” He stated that he and other members of the enslaved community on the Mikell plantation were sent to St. Andrews Parish during the war for safe keeping. In 1866, he left St. Andrews and went into the city and joined the service. He stated he went alone, and was taken by boat with others to Hilton Head, SC, where he was mustered into Company F, 103rd United States Colored Troops. He listed the names of his officers and stated that he thought he was about 21 when he joined the army. The examiner noted that Albert measured 5 feet, 8 1/2 inches tall. Albert stated that as a soldier, he went from Hilton Head to Savannah, then to Brunswick, GA, then to Macon and Columbus, GA and back to For Pulaski, where he was mustered out. He did not fight in any battles. He stated that he was never treated in the hospital in the service, but was sick about camp a few times. He also hurt his knee by a fall but was not laid up from it. He stated that he did not have rheumatism or catarrh in the service but he had suffered from chronic catarrh for the last 6 to 10 years. He wasn’t sure if he was ruptured when in the service but found that he was shortly after his muster out and return home. He stated that he could not prove by anyone that he was suffering from anything he had in the service. Albert stated that he did not know he had a claim pending under the general law – he had gone to George McCants and told him he wanted to file for a pension. McCants made up the papers and sent Albert to the post office to mail them. He did not know what McCants wrote in the papers but just left it all to him. He stated that he had not been laid up in the past 5 years. In the winter, he worked as a stevedore, loading cotton onto ships, in the summer he worked on truck farms and sometimes sold fish in the streets. At the time of his statement, he was working at the Exposition Grounds as a job hand at 75 cents per day. Declaration for Pension,Pension File of Albert Fell, certificate #1,108,882. 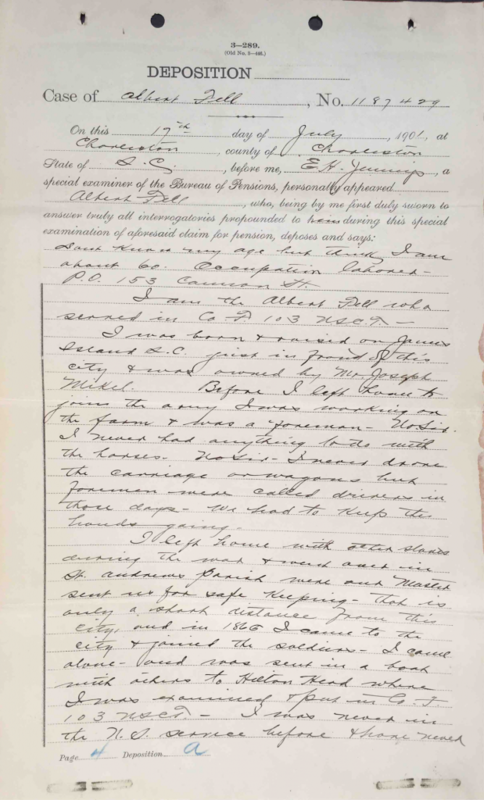 Statement of Albert Fell,Pension File of Albert Fell, certificate #1,108,882. Summary of statement of Robert Johnson, 22 Jul 1901: Robert Johnson stated that he was 61 years old and a cooper by trade. His address was 5 Laurel Street, Charleston. Johnson stated that he was born and raised in Charleston and was born free. In 1865, he enlisted and was placed in Company F, 103rd USCT. He listed the officers of the regiment and stated that he was taken with fever and was treated at the hospital. After he got well, he helped about the hospital until his unit started through Georgia. He was at the hospital 4 or 5 months. He knew Albert Fell quite well, did not know him before the war but met him in Hilton Head where the company was made up. He stated he was made a corporal at once and Albert was made a corporal later. He stated that the Albert Fell who lived on Cannon Street and worked in winter as a stevedore and sells fish in the spring and fall was the same Albert Fell who served with him in the 103rd USCT. He stated that Albert stammered a little when he talked. He stated that he did not know of any ailments Albert had in the military and had not known anything to have kept him from work in the past five years. He had seen Albert several times each year since the war and had not heard him complain of illness. He stated that Albert Fell was a man of good habits. He was not related to Albert Fell. 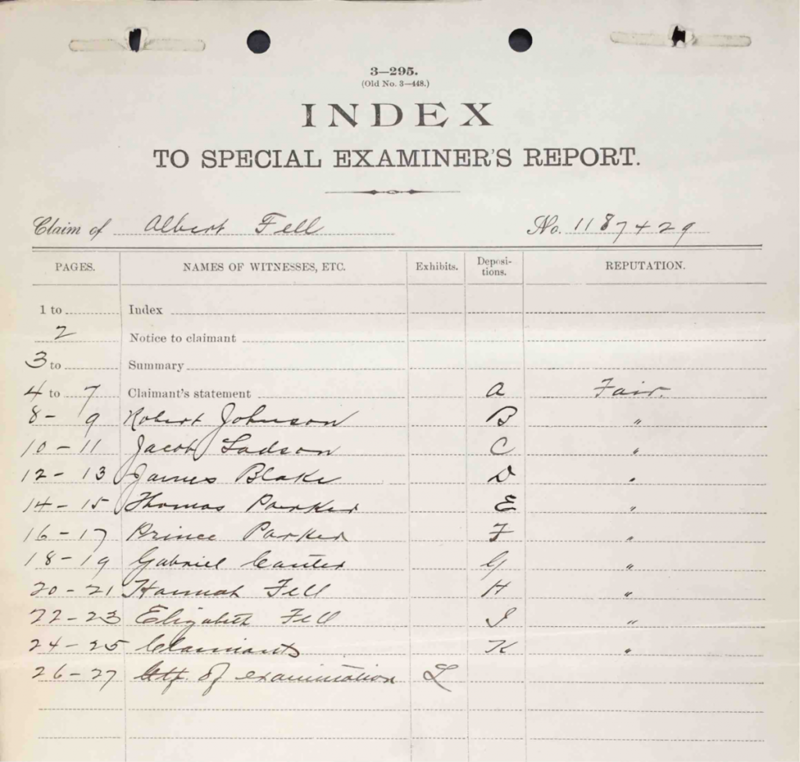 Special Examiner’s Index Sheet,Pension File of Albert Fell, certificate #1,108,882. 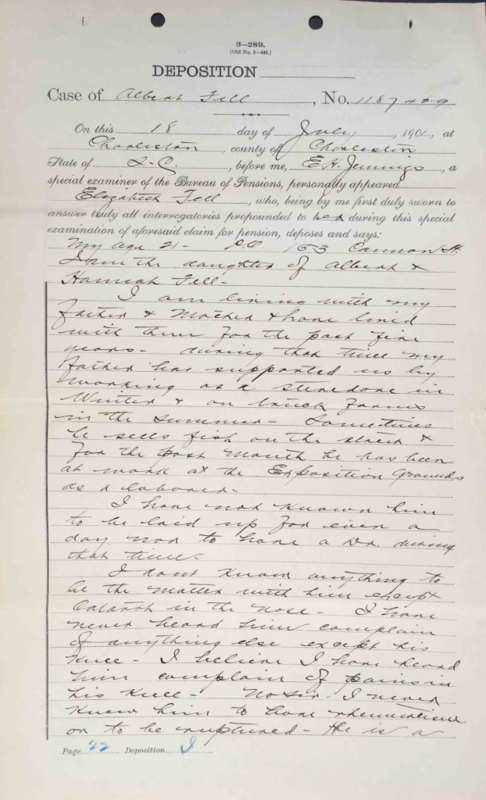 Statement of Jacob Ladson, 19 Jul 1901: Jacob Ladson stated that he was 68 years old and a laborer, living at 108 Wentworth Street. He was born and raised in the city and during the war he enlisted in the service. He was placed in the guard house for one night and the next day was taken with others to Hilton Head, where he was mustered into Company F, 103rd USCT. After he was mustered out at Fort Pulaski, he returned to Charleston and had lived there ever since. He knew Albert Fell in the service, described him as a tall man who stammers a little when he speaks and lives on Cannon Street. He met him in the service. He stated that Albert was a private and then a corporal. He had seen Albert Fell every year since the war and knew him to be positively the Albert Fell who served in Company F, 103rd USCT. He did not know of any illness Fell had in the military or since, and had not hear him complain of any illness. He stated that Albert Fell was a man of good habits. James Blake stated that he did not know his age but thought he was a little over 50. His address was 284 Ashley Ave. He served in Company F 103rd USCT. The examiner noted that Blake had just made a statement in his own pension claim number 1,188,900. He did not know Albert Fell prior to the war but knew him during the service. He stated that Albert was first a private, then a corporal. He had lived in the city since the war and saw Albert Fell every year. He did not know him to complain of any illness and knew Albert to be a man of good habits. He knew positively that the Albert Fell who lived on Cannon Street was the same Albert Fell who served in Company F, 103rd USCT. Thomas Parker stated that he was 61 years old and a farmer who lived in Mount Pleasant, SC. He served in Company F 103rd USCT. He was born and raised just above Mt. Pleasant and lived there before the war and ever since. He enlisted in Charleston and was kept in the guard house for two days before being sent to Hilton Head to muster in. He knew Albert Fell in the service and had seen him since the war in the city. The last time he had met him was the previous October. He described Albert as a large yellow man who stammered a bit. He knew Albert Fell to be the same man who served in Company F 103rd USCT. He did not know of Albert being ill while in the service and thought of him as one of the strongest and healthiest men in the unit. He did not know Albert to be ill since the war and had heard him complain of any illness. Prince Parker did not know his age. The examiner noted that he appeared to be between 60 and 70 years of age. He was born and raised just above Mt. Pleasant and had lived there before the war and ever since. He served in Company F 103rd USCT. He stated that he went with the company to Fort Pulaski and down into Georgia, but was taken ill with smallpox and left in the hospital in Macon. He never rejoined his company when he got well, but was sent to Beaufort and mustered out. He remembered Albert Fell from the service but had only seen him twice since the war. He described him as a large man who stammered and would get angry when they made fun oh him for stammering. He did not know of any illnesses Albert had during the war. Gabriel Canter stated that he was 55 years old and a laborer. His address was 3 Lucas Street. He was born free in Sumter and raised in Charleston. He enlisted in 1865 and was placed in Company B, 103rd USCT. He returned to Charleston after mustering out and had lived there ever since. He knew Albert Fell in the service. He had a brother in law in Company F and would go visit him, and this was how he met Albert Fell. He got to know him quite well and knew that he lived in Charleston and worked as a stevedore and sold fish. He did not know Albert to be sick in the service and had seen him day to day since the war and did not hear him complain of illness. 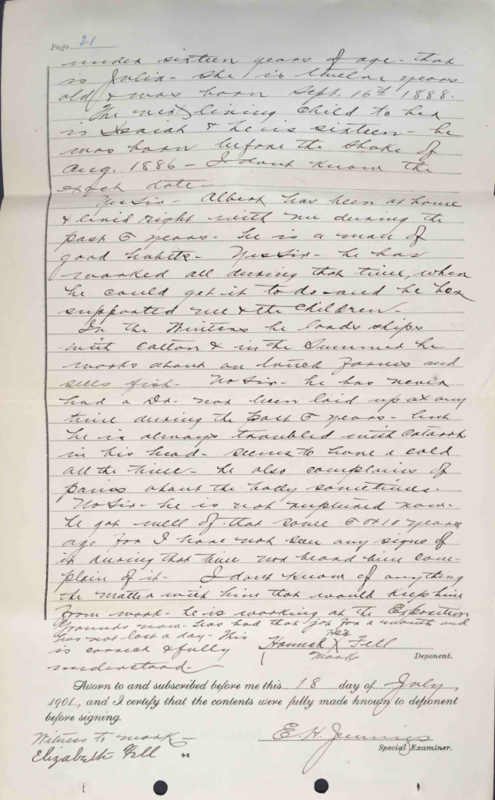 Statement of Hannah Fell, 18 Jul 1901: Hannah Fell, wife of Albert Fell, stated that she was about 55 years old and lived at 153 Cannon Street. She was born and raised on James Island and was enslaved by Tom Legare, who was a cousin to Joseph Mikell, who was Albert’s enslaver. She had known Albert since she was about ten years old. During the latter part of the war she was taken to Chester, SC. Just about the close of the war she returned to James Island. She saw Albert in uniform and he told her he had been a soldier. He courted her for about a year before they were married in Charleston by Reverend Green. They had lived together ever since. She had a marriage certificate but it was lost. She stated that neither she nor Albert had been previously married or lived with anyone else. She had nineteen children with Albert. Seven of them were living and only the youngest Julia was under sixteen years of age. The next living child to her was Isaiah, who was sixteen, born before the shake [earthquake] of Aug 1886, but she did not know the exact date. She stated Albert had been living at home, was a man of good habits and worked when he could find work to do. In the winter he loaded ships and worked on truck farms and sold fish in the summer. She stated that Albert had never had a doctor and had never been laid up in the past five years, but was troubled with catarrh and seemed to have a cold all the time. He also complained of pains about the body sometimes. She stated he got well from a rupture some 5 or 10 years earlier. He was working at the Exposition Grounds for the past month and had not missed a day of work. 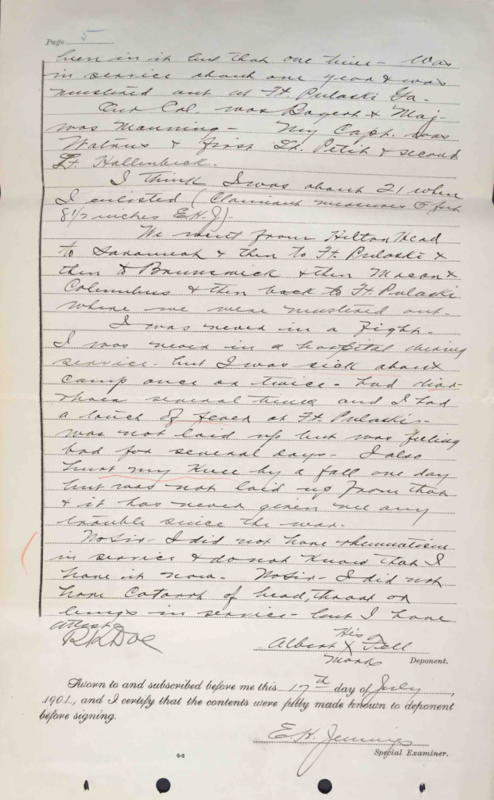 Statement of Hannah Fell,Pension File of Albert Fell, certificate #1,108,882. 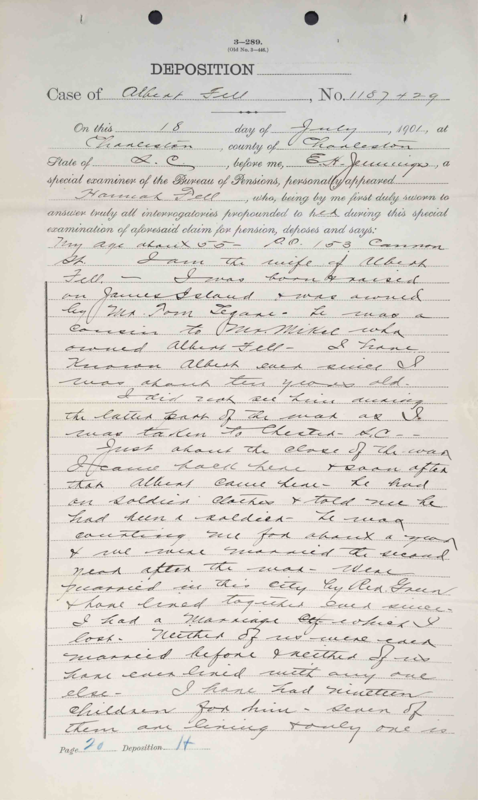 Statement of Hannah Fell, Pension File of Albert Fell, certificate #1,108,882. 18 July 1901: Elizabeth Fell, daughter of Albert and Hannah Fell, stated that she was 21 years old and living at 153 Cannon Street. She had lived at home with her parents for the last five years and her father had supported the family by working as a stevedore in the winter and working on truck farms in the summer, sometimes sold fish in the street and for the past month had been working at the Exposition Grounds. She had not known him to be laid up a day or had a doctor during that time. She did not know of anything to be wrong with him except catarrh and he sometimes complained of pain in his knee. She stated he was a man of good habits and kept at work when there was work to do, and had not known him to be laid up anytime in the past five years. She signed her name to her statement. Statement of Elizabeth Fell, Pension File of Albert Fell, certificate #1,108,882. Nelson Barker, pvt. 916 25th St. 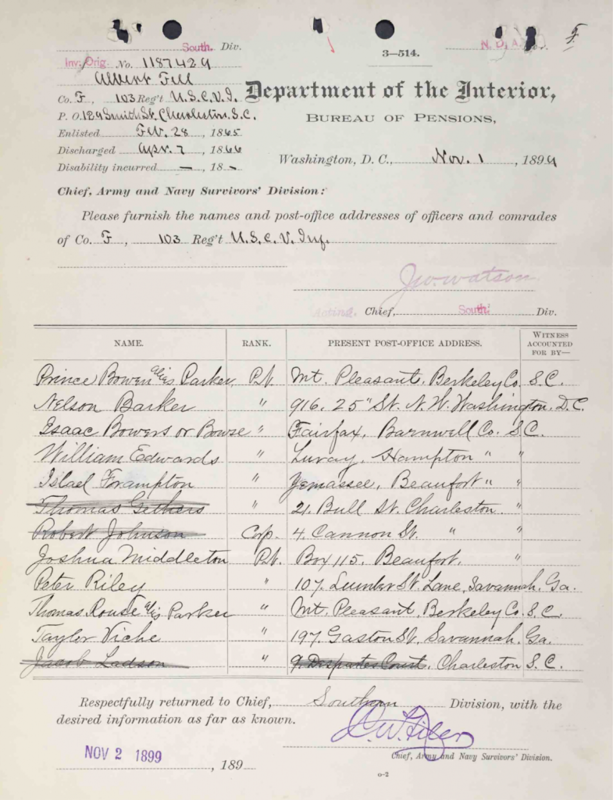 List of Officers and Comrades in Company F, 103rd USCT. Pension File of Albert Fell, certificate #1,108,882. Because Albert Fell lived in downtown Charleston, he and other family members may be listed in the city directory. Albert Fell’s pension file mentions that he held two insurance policies at the time of his death – one with Virginia Life Insurance Company in Charleston and another with the Longshoreman’s Union. Copies of these policies may still exist, and may contain more biographical information for Albert and his family. Papers of the law firms that represented Albert Fell to file pension applications may be preserved in archives. You can search ArchiveGrid to check.